Queens Creek, Miller's Cove, January 2010. I'd name this one "Uh Oh." Well, the calendar says it's New Year's Eve, even if some of us still wonder what happened to Thanksgiving. Did we have Thanksgiving? Was it good? Anyway, it's that time of year to reflect on the past and make well-intended promises of self improvement for the coming week year. Instead of writing about all that, though, I decided to review photos from the year and post ones that never made it on to the blog, for obvious various reasons. Mathews Court Green, March 2010. We sold daffodils here at the Farmers Market. Southwind Pizza, May 2010. Although I didn't use this on the blog, I did submit it as part of my book proposal and paired it with an old photo taken from the exact same angle. Speaking of the book, I have a lot of work to do in 2011. I'll post more exciting random, unrelated photos covering July - December tomorrow. Whatever you're doing this evening, enjoy. p.s. Out of curiosity, what will you be doing this evening? My plans involve a whole lot of Nothing sprinkled with a heavy dose of Lollygagging. Welcome to Three Thing Thursday, the Winter Vacation Edition, where I try to think of something to say and you share whatever is on your mind. 1. We survived Christmas, barely, before being pummeled by a blizzard. That was all fine and dandy, that blizzard, because it forced some very spectacular napping. The best part of all is I took off work this week. Oh, how sweet it is, this thing called no commuting paid vacation. 2. Next, the focus was on quality time with the Chesapeake Bay Children, which was wonderful but not without the typical CBW trials and tribulations that my son and daughter now come to expect with any sort of adventure I propose. 3. One of the adventures involved ice skating, which I love because it reminds me somewhat of roller skating, evidently an extinct sport. Anyone who regularly reads this blog knows that even at the age of almost 46 I secretly want to be on a roller derby team. Skating, the faster the better, is liberating to me. The thought of not just being allowed but encouraged to push people out of the way while flying around the rink? Well, that sounds like a great way to fight off excess stress, which seems to follow CBW more closely than her shadow. 3b. Anywho, regardless of the fact that ice skating and roller derby are not even kissing cousins, CBW performed about an hour's worth of her best speed skating/pretend roller derby routine in the hamster cage of a rink the size of a postage stamp, before her legs grew tired. Plus, with all those mutants other people skating around, the ice was starting to become slushy. Both of these were signs to stop, except she I didn't want to. 3c. In super slow motion the front of my skate globbed ** up on a chunk of errant ice just as I was gearing up for a super fast turn. All I could do was stretch my arms out in front of me and lift my face up just in time to experience what can only be described as a Human Icee land flat on my stomach on the ice. With so much momentum behind me, I screamed for ten minutes slid and slid and slid. Hands, feet and face up, arms outstretched. Sort of like sliding in to home plate. From left field. 3d. When I finally stopped and could lift my head up, there stood Chesapeake Bay Son, just an inch or two away from where I stopped sliding. All he could muster, also in super slow motion, was, "Oh. My. God." Now it's your turn to share three things, whatever happens to be flying around your head. Hopefully ice, ice skates, the accompanying sharp blades or any associated embarrassment are not involved. *When I started writing this, I had no idea I'd be talking about the Ice Skating Incident, rife with stress and therefore the perfect fuel to jump start my blogging embers. So never mind that opening paragraph about not having anything to say. I don't have anything to talk about except my two bruised knee caps and one embarrassed son. In other words, it's an ordinary day around here. ** "Globbed" is most definitely a word, located on page 612 in CBW's Dictionary of Ridiculosity, coming soon to book stores near you. These are from my Christmas Eve trip down to Onemo, an effort to quiet my mind and distract myself from all the work that needed to be done. To the left as you walk down the public landing are the remains of an old dock. The way the boards are situated reminds me of the very first dock I remember walking on, over at my grandparents' house. My grandmother used to take me out on her dock to feed the sea gulls. We would throw out meat scraps, usually pieces of ham, the fat parts everyone trimmed off. The sea gulls loved it. But what was most memorable about that dock was how narrow it was and how it was constructed. Typically when you step onto a dock, you are walking on boards placed horizontally in front of you. My grandmother's dock consisted of a couple planks of wood placed lengthwise, much like the boards above appear to be situated. Although I'm not doing a very good job of explaining things, I do know that dock was different and you don't see them made that way any more. Probably for good reason, as I remember being scared almost every time we went out on it. There wasn't much room to turn around. Plus those sea gulls can be aggressive, especially when you're gripping clove-studded ham bits. Anyway, isn't it funny how something as simple as the image above can open the floodgates to so many memories? In other news, this blog is taking a break for the next couple of days and will return on Thursday. Hope you have a fantastic week free from aggressive sea gulls and unstable docks precarious situations. Saturday evening, just as we were sitting down to Christmas dinner, snowflakes started falling from the sky. They fell, and they fell, and they fell. All through the night. Just when we thought it would never end, it didn't. As I write this on Sunday evening, at least two feet a foot is on the ground, and the occasional flake is still falling. Yesterday was the perfect day to not get dressed. Having an excuse to kick back with the clicker and nap on and off every hour on the hour was absolutely priceless. Mother Nature pretty much said, "Sleep. As much as you want. And even more. Enjoy." Thank you, Mother Nature. I love you. And I did. Aside from establishing a regular nap routine, Mother Nature's reason for providing so much snow is that Chesapeake Bay Woman was supposed to leave town with her two children for a few nights is immaterial, but Chesapeake Bay Woman sure is glad she took off from work this week and is loving every minute of all this snow. Christmas Eve, I tore myself away from the stuff that needed doing and went for a long, deliberate walk up and down Williams Wharf Road (not pictured here). Afterwards, still in no mood to return home, I headed aimlessly for the public landing near Onemo (pictured here). The sun, in no hurry whatsoever, was contemplating setting. After snapping some quick pictures, I hopped back in the car and returned home to stand on my feet for another eighteen hours prepare for Christmas. Now that Christmas is behind us, I eagerly await a nap. Or ten. Merry Christmas to both all of you out there. Peace, joy and love from the Chesapeake Bay Family. 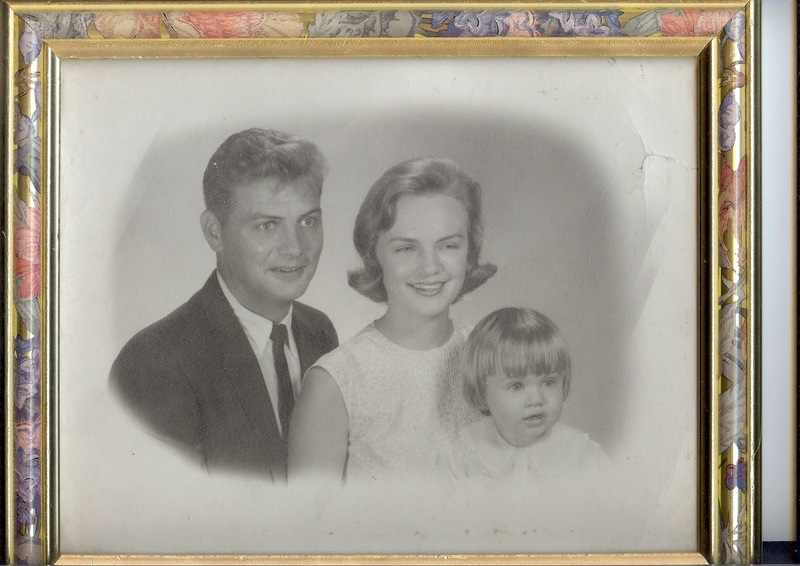 This is a scanned photo (yes, scanned while still in the picture frame) of me, my father and mother circa the year electricity was invented 1966-'67. Just look at the happy smiles on everyone except baby Chesapeake Bay Woman, whose stunned look of disbelief is no doubt related to that haircut she's suffering sporting. Ever since that picture I've rebelled against bangs and bobs of any sort. We won't even talk about the Dippity Do they used to put on my hair. Oh, the humanity. But this post is not about me or my perceived indignities hair. It's about my mother who is celebrating a birthday today. Having a birthday on Christmas Eve really bites. She'll be the first to tell you so, although I doubt she'd say "bites." Birthday presents are usually an afterthought for the giver, who by the time Christmas Eve arrives is usually ready to collapse from exhaustion focused on surviving last-minute Christmas preparations. Birthday cakes get lost in the shuffle of fruitcakes, gumdrops, candy canes and eggnog. Tonight, however, Chesapeake Bay Mother is throwing her own birthday party which will include a bounty of seafood. I've been told to bring a seven-layer Mexican dip, which certainly cannot be confused with standard Christmas fare. Baby Sister will travel home from Richmond to help us celebrate. Unfortunately Middle Sister, who lives in Georgia, won't be with us as she is preparing for a trip to Jamaica her own Christmas celebration there far away from this bunch. Although I live right next door to my parents, and Baby Sis is not that far away, we really don't get together as often as we should. This birthday party is bound to be loaded with fun and laughter. Before I close, I'd like to share a story involving my mother and Christmas--but not necessarily her birthday--because an inability to separate her birthday from Christmas appears to be the theme of this post. One year she was performing the seasonal dance we all know called Decorating Under Duress, the Stress Edition. She had decorations everywhere and cords---miles and miles of Christmas lights, some old and some even older than that--stretched and entangled all over the living room floor. As her mother mopped her brow and hollered for Baby Sis and Middle Sis to break up whatever fight they were in, Chesapeake Bay Angel Oldest Sister decided it was time to lighten things up a bit and do away with all this tension in the air. Just as my dear mother bent over to plug some half-frayed cord of lights into a socket to make sure they worked, Chesapeake Bay devil Oldest Sister clapped her hands sharply and loudly. You know, the sound one might hear just before being electrocuted shocked from a frayed electrical connection. Well, some of us found it funny. Others did not. And that's all I have to say about that. Happy Birthday, Chesapeake Bay Mumma! This is the Christmas tree that tries to kill me year after year. It's an 8-foot, artificial number that I've struggled against had for over a decade. Every December I have to haul this monster up from the bowels of the basement and painstakingly put it together limb by just shoot me now limb because the Chesapeake Bay Children love it. Yay! Of course they are noticeably absent whenever the arduous battle of CBW vs. Artificial Tree commences. The mere mention of dragging those dreaded bins up ignites flames at their heels. There's talk of homework to do and root canals to be had. My tree is always plotting against me a hodgepodge of decorations, from the vintage 1970 glass bulbs to the soon-to-be-collectible if not lethal one dollar bead garlands from Dollar General. Actually, I love the Dollar General garlands and sometimes scatter them atop the Christmas table for an added dose of lead festivity. But the Chesapeake Bay Family Christmas tree is not just about CBW toting bins loaded with prickly branches up from the depths of hell basement by herself; nor is it about her quirky hodgepodge of decorations. Unbeknownst to the casual observer, CBW has a theme in her decorating, and it's called terrorizing! Having a Little Fun, in a passive-aggressive sort of way. 'Tis the season, no? Remember Rudolph the Red-Nosed Reindeer, the Christmas special that has come on every year since decades before TV was invented 1964? Well, back when CB Son was a toddler, I bought a Rudolph tree skirt and all the Rudolph characters, which I placed in some specially designated area atop a shelf or a piece of furniture. They had their own space, these Rudolph characters, and they were arranged just so. Now that CB Son and Daughter are older, and run like the dickens whenever this whole Christmas decorating ordeal occurs, I've taken some liberties with Rudolph and his happy clan. Take, for example, Yukon Cornelius, below (click here for audio clip), who single-handedly demoted the Abominable Snowman to Frosty status. He doesn't look so tough when he's dangling helplessly from a tree now, does he? And is that Santa Claus way below him, unable to even make eye contact? Speaking of eyes, is that a fear of heights I see in yours, Mr. Cornelius? That's not a very good trait for a prospector. Tut-tut. And here's old Hermey, the rebellious little misfit of an elf who wanted to be a dentist rather than make toys for the children of the world. (Click here for the audio proof.) Hermey, you should be ashamed. A dentist? Really? Right now, he looks like he'd rather be performing a root canal. On himself. Nice hair, Hermey. How many cleanings can you perform while teetering precariously from the end of a tree limb, hmmm? We won't mention all the hullabaloo going on over in the Santa Claus display. The Santa Claus below looks like he's saying, "Oh nooooooooooo!" I promise I've not lost my last marble- it's rolling around somewhere waiting for me to pick it up and dust it off. This week has been stressful, and for some reason stress always makes me want to torment certain Christmas decorations brings out my slightly off-kilter sense of humor. Things will return to normal, however that is defined, soon. For those of you who celebrate Christmas, I beg you to add a dose, however slight, of silliness to your decorations. For example, hang a slice of bread (or something equally ridiculous that you or others will find funny) on an ornament hook and put it in a not-so-obvious place on your tree. Even if nobody else sees it, you'll know it's there and can have a secret snicker. Laughter is, after all, the best medicine and to me the greatest gift, even if the source involves rebellious, misfit dentists and odd little moustached prospectors being rendered utterly and completely helpless. Generally speaking, change is not synonymous with Mathews County. We tend to like things the way they are and stubbornly resist outside influences. More narrowly speaking, however, as in from the viewpoint of my camera lens, change to the scenery can be swift, frequent, drastic and dramatic. The same old view rarely looks the same way twice. For example, these first two photographs, of a point of land on Queens Creek near Smithers Cemetery, are basically the same as far as content, but what a difference there is in the colors. The two below are of the same point of land, just a little closer in. As mentioned a few days ago, I don't know how to edit photographs. Even if I did, I probably wouldn't because I have no spare time nor any desire to fiddle around with the pictures I take. The differences here in lighting and color are completely natural. And I find that amazing. Of course, I don't get out much. p.s. Over the next couple of weeks postings will be sporadic rather than daily. This week I must work while simultaneously scrambling preparing for Christmas. Next week I hope to slow down; enjoy life, admire the scenery and spend time with the Chesapeake Bay Children, just in time to be flung head first into 2011 when the book will become a priority in addition to all my other responsibilities. I might move to an every other day posting schedule or simply a photo a day (without words) format but the bottom line is this blog will be slowing down some. Have a great week! Last week it snowed twice here. This shot of a tree just up the creek from me was taken after Thursday's snow. I have a love-hate relationship with the locust tree, below, that lives in my back yard. I love to hate it. This was taken during the little bit of snow that fell last Monday. As I write this on Saturday, there is a chance for rain, snow or a mixture depending on who's talking. The Chesapeake Bay Children and I love snow. After Thursday's snow fell, they used a ski rope to hitch a boogie board to the back of the John Deere Gator. With Chesapeake Bay Son behind the wheel, Chesapeake Bay Daughter almost flew into a tree and Chesapeake Bay Woman, after letting go at a key "crack the whip"moment ended up sliding out of control backwards towards her very solid brick house before shifting directions and careening towards her also very solid vehicle. Luckily Mr. Toad's Wild Ride the board came grinding to a halt in the driveway thereby eliminating the need for the call to the paramedics. These photos were taken last weekend from Gwynns Island, at the boat yard now used by the Mathews Maritime Foundation. One of CBW's friends Some locals fondly refer to this tiny, narrow patch of property as "Pulley's Swamp," since Mr. Pulley's business (Pulley's Marine) was based here for many years, and at low tide the marsh smells like creek mud can appear swamp-like. There is nothing quite like the smell of creek mud on a hot day at low tide, and I'm not saying that's a good thing. As long as I'm off on this tangent, but entirely unrelated to the creek mud remark, let me add that Chesapeake Bay Father worked for Mr. Pulley repairing outboard motors for some time after retiring from the Naval Weapons Station. As long as I'm talking about his past jobs, and I appear to be, during high school in the late 1950s he worked at the old ice plant, barely visible in the photo above. I believe he delivered ice to local businesses, but don't quote me on that--or anything. Another early job? Cutting grass at Smither's Cemetery. In the '70s and '80s, he was co-owner (and the "V") of V&M Service in the courthouse, where he is still was known as the Volkswagen expert. But my favorite of all? Drummer for many bands, including the legendary Dynatones. Let's return to the blog post, which started out having something to do with these photographs. On this cold, overcast day, the sun barely peeked through the clouds in the direction of the Hole in the Wall. I've always loved that name, Hole in the Wall. As opposed to Pulley's Swamp, Hole in the Wall is an actual, official name which refers to a channel leading boaters from the bay to Milford Haven (or vice versa). Those of you who know this already are yawning. Those of you who don't know it are blinking back tears of boredom. In the best interest of all parties, let's move on, shall we? Although I take thousands of photos in Mathews, very few make it to my "favorites" list. These do. For the record, they are unedited, "straight out of the camera," since I don't know any other way. The only time I've ever made any changes to a photo was back when I had dial-up internet and Meg from Soup Is Not a Finger Food showed me how to compress the size to make them load faster. Enjoy the pictures and enjoy your weekend, which hopefully will be free of mud, tears, boredom, holey walls and too many tangents. Although I happen to think tangents, like variety, are the spice of life. Welcome to Three Thing Thursday, where I share forty three things and you share three, four, five or more things, who's reading counting? 1. Monday night I was so excited about Don W.'s Old House Woods guest post that was scheduled to go up the next day. He and I had been trading e-mails for several days, and the last communication that night asked him to let me know if there were any glaring errors after it posted just around midnight. I would make any edits the next morning at 5:30, which is when I get up for work and check e-mail before guzzling a gallon of coffee driving four thousand miles in the bitterly cold darkness. 2. But, as CBW's magnetic field luck would have it, at 5:30 Tuesday morning, my internet did not work. Since I have no "smart" phone, no mobile internet, and very restricted internet access at work, I naturally panicked because I didn't know if the post was up; if Don had sent me corrections; or if I was going to be able to function for the rest of the day since my morning routine was entirely disrupted. In short, I was a basket case tad flustered. 3. At work, I accessed enough internet to discern that (a) the post was up and (b) Don hadn't sent any revisions so (c) I could focus on having my personal technical consultant, Chesapeake Bay Son, diagnose and repair the internet problem while (d) continuing on with life which is stressful enough without unnatural disasters like lack of internet wreaking havoc on one's blood pressure. At Dinner O'Clock I called him in a panic. He very calmly picked up after the first ring. As I was trying to explain who I was, he said in a very soothing voice, "I am reading your Old House Woods post now." Then I tried to explain the shituation happening with the internet, using terms such as "the black thing" or "the flat white thing with two antennas" or best of all when I said "wan connection" and however I said "wan" made CB Son and Daughter crack up into hysterics and who here is still awake? 4b. When Hallieford Jim said he would be over the next morning to fix the problem, I hung up the phone and breathed a huge sigh of red wine relief. Last night when I arrived home, everything was back to normal. All I needed was a new modem. The other one-- recently purchased-- is broken due to the magnetic field that surrounds me and causes everything to spontaneously malfunction. Chesapeake Bay Son, a very reasonable, logical and methodical thinker, can confirm the magnetic field theory, particularly as it relates to the modem malfunction. 4c. Regardless, I cannot thank Hallieford Jim enough for coming to the rescue--again. If anyone in the Mathews vicinity is interested in high speed internet, please click here and give Jim at Rivah Broadband a call. He'll hook you right up. 5. In other news, I just won a contest over at Averett Lady Nana's blog! 6. The forecast as this is written calls for 100% chance of snow today. I say bring it on. 7. Today's post should have been called "Too Many Things." Having internet access miraculously restored; winning a contest; and waiting on "guaranteed" snow have made me a little giddy. Now it's your turn to share as many things as you'd like. Whatever is on your mind. Anything at all. Here are a few more shots from Saturday's Christmas parade. Since it was drizzling, I opened the back hatch of my car and stood underneath, which didn't necessarily make for great photos, so my apologies in advance. With me were Chesapeake Bay Son, Daughter, two of their friends and several of my friends, one of whom was Lucy. Lucy and I played basketball, ran track, and laughed together in high school. We are were both very silly. To this day, the first thing we do when we see each other is bust out laughing. Over nothing in particular. Just the sight of each other is enough to ignite a session of incessant cackling. My high school English teacher might bust out crying over the use of bust out instead of burst out, but my English teacher needs to understand that there's a difference between formal writing and my writing conversational writing. Also, I think I just made up the term conversational writing, which may well be an oxymoron, so let's stop this side note and my parenthetical additions before they take over the blog post. Watching the parade with Lucy was something else, let me tell you. Below is another friend from our class, Glenda. She's always smiling, even while marching for miles in the cold rain. She also makes a mean deviled egg, fyi. But that has nothing to do with Christmas or the parade. Just a bit of trivia. Hi, Glenda! The car below was festive and cheerful. A happy entry. The clown below was slightly less than cheerful at having to walk through the rain. She pretty much said so when she marched by, bless her heart. Right around this point, Chesapeake Bay Daughter's friend declared her fear of clowns. Mrs. Clown didn't hear her though. I love clowns. Remember Bozo the Clown? Anyone? Speaking of enthusiasm or lack thereof, the Chesapeake Bay Children (in their Santa hats) and one of their friends (wrapped up like an Eskimo), pretended not to know me and Lucy, who were squealing with delight, laughing, hootin' and hollerin' at the passersby. Honestly, it was difficult to discern which spectators were children and which were supposed to be the adults. Just look at the enthusiasm, joy and embarassment festivity on their faces. Lastly, speaking of adults acting like children friends, here's a picture of me and Lucy trying to act like we have some sense to stay dry. Although I missed the usual Mathews-themed entries, such as boats and farm equipment, I thoroughly enjoyed the parade, even if the rain did cut the festivities short. Any time spent laughing with friends, though, is time well spent. Yesterday was the Mathews Christmas parade. This year's parade was different. Typically, the nighttime event was led by a man on a horse. This year's parade, held during daylight, was led by an iron horse of a different color to mix a few metaphors. The skies had been overcast all day. Just as things were getting started, the first few drops of cold rain fell, which may explain why Santa Claus came first rather than last. I'd give anything to drive this fun little vehicle. All of life's stresses could be cured with just one turn behind the wheel of this thing. There were several vintage vehicles participating. I wanted to drive them all. I think it'd be fun to drive one of these firetrucks too, but I'm pretty sure I'd need a CDL to do that legally. Over the next few days I'll share some of the approximately fifty thousand photos of the abbreviated parade. In the meantime, I think I'll look up the requirements for obtaining a commercial driver's license.